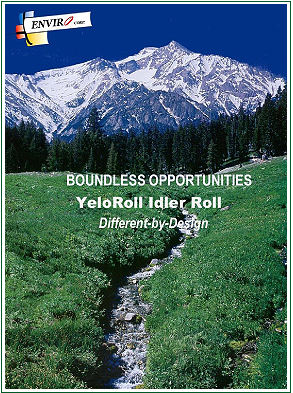 Innoveyor is the world leader in composite idler technology and the manufacturer of the YeloRoll.® The Yeloroll is an titanium enriched T-PVC idler roll, that compensates for bearing and shaft misalignment. It features proprietary InnoFlex® Self-Aligning bearing technology. Self-Aligning bearing technology allows for misalignments of the shaft in relation to the housing rotation, thus increasing the up-time of conveyor systems and capable of running cooler at higher temperatures. Improved bearing life and conveyor roll performance can be directly attributed to InnóFlex® technology. This is just another innovative idea by Innoveyor Inc. The YeloRoll® is not another slick polythene HDPE roll, it is 60% lighter, and won’t melt or burn, like other HDPE rolls! President, Dan Stahura’s family has maintained a strong presence in the mining industry since the early 1940’s. Innoveyor Inc. also offers 30 years of mining experience, and 20 years of in-house polymer chemist and engineer on staff.